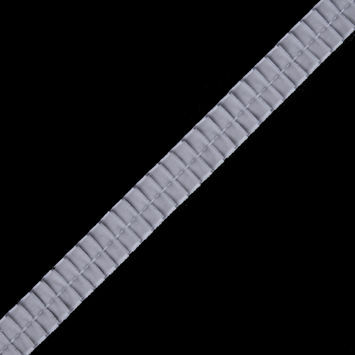 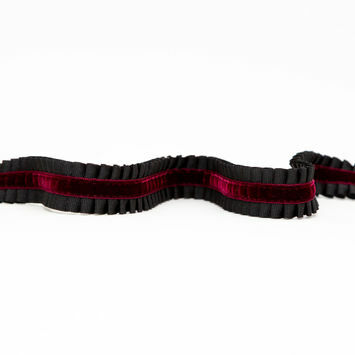 Pleated and Plisse Ribbons are an excellent way to add details to simple garments. Plisse is a chemically pleated fabric with irregular pleats or wrinkles that are more defined than your average crinkled fabric. Pleats are a fold that is formed by taking fabric and doubling it back on itself. Pleats are either pressed, or heat-set into a crease, or unprocessed. 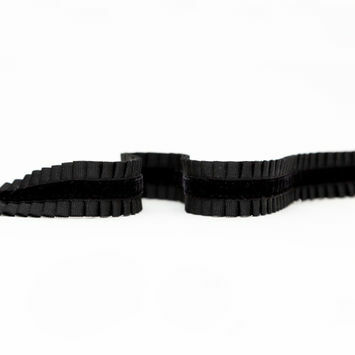 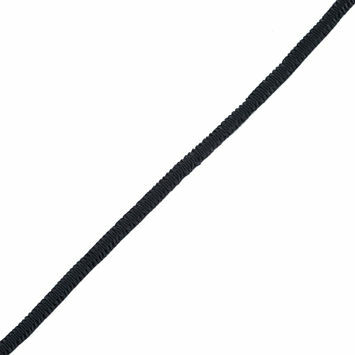 Use pleated and plisse ribbons for detailed headbands and as a subtle trim on necklines and hems. 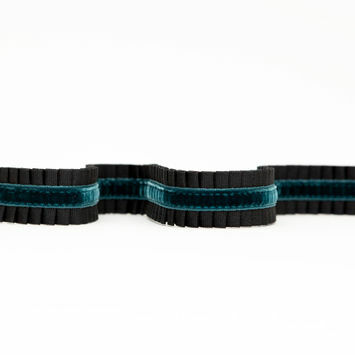 Italian Black Pleated Grosgrain Ribbon with Velvet Center - 1"
Italian Black and Blue Pleated Grosgrain Ribbon with Velvet Center - 1"
Italian Black and Wine Pleated Grosgrain Ribbon with Velvet Center - 1"
Italian Black and Teal Pleated Grosgrain Ribbon with Velvet Center - 1"
Black Satin Plisse Trim - 0.875"
Italian Green Plisse Trim - 0.625"
Italian Blush Plisse Trim - 0.625"
Black Stretch Pleated Grosgrain - 0.375"
Italian Rose Deep Knife Pleated Trimming - 1"
Italian Blush Deep Knife Pleated Trimming - 1"
Italian Champagne Deep Knife Pleated Trimming - 1"
Italian Dark Gold Deep Knife Pleated Trimming - 1"
Italian Green Deep Knife Pleated Trimming - 1"
Italian Bright Pink Deep Knife Pleated Trimming - 1"
Italian Silver Velvet Knife Pleated Trimming - 0.875"
Italian Black Velvet Knife Pleated Trimming - 0.875"
Italian Wine Deep Knife Pleated Trimming - 1"
Italian Victorian Blue Deep Knife Pleated Trimming - 1"
Italian Lavender Deep Knife Pleated Trimming - 1"
Italian Navy Deep Knife Pleated Trimming - 1"
Italian Colonian Blue Deep Knife Pleated Trimming - 1"
Italian Baby Pink Deep Knife Pleated Trimming - 1"
Italian Dark Brown Deep Knife Pleated Trimming - 1"
Italian Copper Deep Knife Pleated Trimming - 1"
Italian Electric Blue Deep Knife Pleated Trimming - 1"
Italian Kelly Green Deep Knife Pleated Trimming - 1"
Italian Blue Deep Knife Pleated Trimming - 1"